Conventional hardness testers, like Rockwell, Brinell or Vickers machines, require the test piece be brought to the testing device; but this is not always possible. Portable testing devices have been developed that permit in-situ and on-site hardness measurements thus offering quick and economical supplements to conventional, stationary testing machines. With regard to metals, hardness has always been a subject of much discussion among technical people, resulting in a wide range of definitions. Hardness properties include such varied attributes as resistance to abrasives, resistance to plastic deformation, high modulus of elasticity, high yield point, high strength, absence of elastic damping, brittleness or lack of ductility. To a metallurgist, hardness is a materials resistance to penetration. In general, an indenter is pressed into the surface of the material to be tested under a specific load for a definite time interval, and a measurement is made of the size or depth of the indentation. Hardness is not a fundamental property of a material, but a response to a particular test method. Basically hardness values are arbitrary, and there are no absolute standards for hardness. It has no quantitative value, except in terms of a given load applied in a specific, reproducible manner and with a specified indenter shape. Static indentation tests in which a ball, cone or pyramid penetrates into the surface of the material being tested are widespread. The relationship of load to the area or depth of indentation is the measure of hardness, such as in common bench-top Brinell, Rockwell, Vickers or Knoop hardness testers. The different methods and differently shaped indenters used by e.g. Brinell and Rockwell produce dissimilar responses of the material under test. So-called conversion tables relating to HRC and HB values are only approximations - there exists no mathematical equation to transfer measurements from one scale to another. Conversion tables have to be determined empirically by experimental evaluation of a specific materials hardness with the different test methods. To compare the hardness of two different samples, both must be measured using the same hardness scale, or a scale must be developed to convert from one measurement to the other. In manufacturing applications, materials are primarily tested for two reasons: either to research the characteristics of a new material or as a quality check to ensure that the sample meets a particular specification. Mobile hardness testing is on the advance in the field of on-site application within the modern production process and plays an ever increasing part when testing large geometry parts and positions which are difficult to access. The test piece needs no longer to be cut and to be brought to the hardness tester - today mobile handheld instruments allow measurements to be made on the spot. There are two different physical methods particularly recognized in the practical field and which are accepted tools for many applications. The application possibilities are far ranging, this includes large as well as small parts, and especially applies to positions which are difficult to access. Fig 1: Hardness testing with a UCI instrument on the tooth flanks of a pinion shaft. Fig 2: Hardness testing with a rebound tester on the drive wheel of a large hydraulic digger. One popular device measures the frequency shift of a resonating rod having a Vickers-diamond tip, which occurs when the diamond penetrates into the test material by applying a specific test load. The frequency shift is evaluated, electronically converted and displayed as a hardness value on an LCD. MICRODUR instruments work according this method, using the so-called UCI (Ultrasonic Contact Impedance) principle (see Fig. 1). Another well-known principle for portable hardness testers is the rebound method. Instruments working according to this method measure the velocity of a propelled impact body directly before and after impact onto the test materials surface. The ratio between both velocities indicates the hardness of the material, which can be converted into different scales by using pre-stored conversion tables for different materials (see Fig. 2). Krautkramer developed two series of portable hardness testers operating on the UCI Ultrasonic Contact Impedance principle (MIC 10 instruments) and the rebound principle (DynaMIC and DynaPOCKET instruments). As in standard Vickers or Brinell hardness testing, the question as to the size of the test indentation in the material generated by a certain test load also arises in Vickers hardness testing according to the UCI (Ultrasonic Contact Impedance) method. However, the diagonals of the test indentation, which have to be known in order to determine the Vickers Hardness value, are not evaluated optically as usual, but the indentation area is electronically detected by measuring the shift of an ultrasonic frequency. A UCI probe typically consists of a Vickers diamond attached to the end of a metal rod (Fig. 3). This rod is excited into longitudinal oscillation at about 70 kHz by piezoelectric transducers. Imagine instead of the metal rod (we refer to it as oscillation rod) a large spiral spring held at the end and oscillating at a resonant frequency of 70 kHz at the free end (Fig. 4). Fig 3: Schematic description of the UCI probe. Fig 4: UCI principle in an imaginary experiment: an oscillating spring in contact with material. The spring symbolizes the oscillating rod, the contact plate symbolizes the diamond, the material springs symbolize the material and its elastic constants. At the very top of this spring (free end) there is a contact plate, the Vickers diamond. The test material, with which the Vickers diamond comes into contact, can also be imagined as being a system of smaller spiral springs positioned vertically to the surface - an atomic bonding, two atoms inter-linked via a "spring". If only one of these "atomic springs" is touched by the Vickers diamond in this imaginary experiment - like very hard material in which the diamond only slightly penetrates and thus produces a small indentation - then an additional spring, i.e. mass, is coupled to the large spiral spring. By doing this, the resonant frequency shifts due to this additional mass / spring. This frequency shift will become greater when additional "springs" are touched, that means if the diamond penetrates deeper into a material of medium hardness, and the test indentation becomes larger. Analogously, the largest frequency shift is produced by soft test materials; the diamond penetrates deeper into the material and leaves a large indentation. This is the secret of UCI hardness testing: the frequency shift is proportional to the size of the test indentation produced by the Vickers diamond. Equation (1) describes this basic relation in comparison to the definition of the Vickers hardness value. Equation 1: The Frequency shift is proportional to the indentation size of a Vickers indentor. HV = Vickers hardness value, and F= Force applied in the Vickers hardness test. To carry out the UCI principle, a probe containing a rod with a Vickers diamond attached to the contact end is resonated by piezoelectric ceramics at an ultrasonic frequency. A spring applies the load and the frequency of the rod changes in proportion to the contact area of the indentation produced by the Vickers diamond. Therefore the hardness value is not visually determined by the diagonals of the indent, but by an electronic measurement of the frequency shift within seconds. The instrument constantly monitors the frequency, performs the calculation and instantaneously displays the hardness value. The frequency shift nevertheless also depends on the Young's modulus of elasticity, which is a material constant such as the spring constant in our mental experiment. For the practical application of the UCI-method, the Young's modulus therefore has to be considered. The instrument has to be calibrated when the hardness of different materials with different values of the Young's modulus has to be determined. After completing the calibration, the UCI method can be used for all materials showing this modulus of elasticity. When being manufactured, the probes are calibrated on low-alloyed or unalloyed steels; however, modern test instruments can be calibrated quickly, also at the test location, to other materials as well, such as titanium or copper. 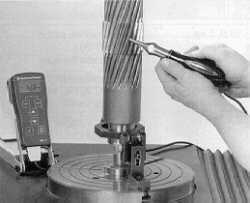 Hardness testers using the Rebound method operate in a slightly different manner. Although the size of the test indentation generated is connected with the material hardness even in this case, it is indirectly measured via the loss of energy of a so-called impact body. Fig. 5 illustrates the physical principle of measurement. A mass is accelerated to the surface of the test object and impinges on it at a defined speed, i.e. kinetic energy. The impact creates a plastic deformation of the surface, i.e. an indentation, due to which the impact body loses part of its original speed - or energy. It will lose more velocity when creating a bigger indentation on softer material. Technically, this principle of measurement is implemented by means of an impact body which has a spherical tungsten carbide tip and which is accelerated onto the test surface by spring force. The velocities after and before the impact are each measured in a non-contact mode. This is done by a small permanent magnet within the impact body (Fig. 6) which generates an induction voltage during its passage through a coil, with this voltage being proportional to the speed. Equation 2: The Hardness value according to Leeb (HL) is defined as the ratio between the rebound velocity (vR) after and the impact velocity (vI) before the impact of the tungsten carbide ball onto the test piece surface. Fig 5: The basic principle of the rebound hardness test. Ekin = kinetic energy. Fig 6: Cross-cut of a typical impact device. You might ask yourself: "Who wants to measure the hardness value in Leeb?". The answer is: as a matter of fact, anybody who uses the rebound hardness testing method does it because the Leeb hardness value is, by definition in the equation (2), the actual physical measurement value behind this method. However, nearly no user indicates the Leeb hardness value HL in his specifications or test reports. We mostly convert into the required hardness scales (HV, HB, HS, HRC, HRB, N/mm2 ). For this reason, only conversion brings the rebound hardness method to life. Empirically determined conversion tables for different material groups are stored in the DynaMIC and DynaPOCKET instruments. To apply the principle, an impact device uses a spring to propel an impact body through a guide tube towards the test piece. 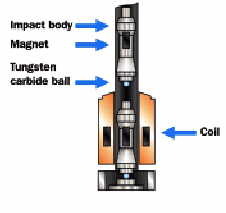 As it travels towards the test piece, a magnet contained within the impact body generates a signal in a coil encircling the guide tube. After the impact, it rebounds from the surface inducing a second signal into the coil. The Krautkramer instrument calculates the hardness value using the ratio of the voltages and analyzes their phases to automatically compensate for changes in orientation. Due to the patented signal processing there is no need for any manual correction for the impact direction. Only the Krautkramer hardness testers DynaMIC and DynaPOCKET offer this autobalancing feature. Application solutions are determined by the force and indenter of the impact body. The operator can select between different impact devices for the DynaMIC (Dyna D, Dyna E and Dyna G) as well as the DynaPOCKET. Mobile hardness testing instruments will not replace the conventional bench-top machines, but nevertheless, they became an indispensable addition for hardness testing units. 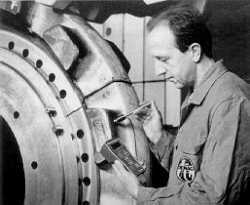 During the last decades several portable instruments based on different physical methods were developed. Today portable units are widespread and accepted tools for portable, on-site hardness testing applications. Those instruments solve plenty of mobile hardness testing tasks, but however, each method is limited - more or less - to a specific application area and, therefore, the decision as to which method and instrument to use strongly depends on the testing application.